I am a huge fan of The Ordinary a brand that gives us the best skincare at affordable prices. The Coverage and Serum Foundation marks their step into makeup retailing at about £6 each. I only purchased the Coverage foundation since I prefer full coverage, therefore, the serum foundation is not aimed at me. I felt like this took forever to launch as they reformulated the packaging to provide us with a pump which is what most of us prefer. I decided to wait until Asos stocked them on their site since I have next day delivery. Cult beauty and BeautyBay also stock both of them now. The Coverage Foundation claims to have full coverage and a buildable, lightweight formula.There are 21 shades across the spectrum with unique codes to define different undertones.and depth. The foundation contains SPF 15 and gives a smooth finish. I picked up the shade 1.2 Y - light with yellow undertones when I first received this the colour was a little bit too light since I was still slightly tanned but now it's perfect for my skin tone. Upon first application, I would use the same primers that I normally use with all my other foundations. It was a disaster, it would sit on top of my skin like my nose, it separated slightly, enhanced my fine lines and clung to dry patches, the coverage was also just meh. I also found that I was super oily and I do have oily skin but if I did blot my face the foundation transferred. Overall my first impression wasn't fantastic. I gave this foundation another go because there are mixed reviews. I found it performs at it's best when you just moisturise your face as normal and don't actually use a primer. I found that if you want the best coverage, use a buffing brush like the Spectrum Flat Top Buffer. I do use about 3 pumps, 1 for each half of my face and the extra to mask imperfections more. I have blemishes and scars although it is marketed as full I would only say its a medium with buildable potential slightly masking redness and imperfections since I still see my dark marks. I am still oily without using a primer so it fades around my nose first but if you carry makeup around with you, you can touch up but I don't. It has a satin matte finish, not totally matte but you can tell that you have foundation on. Overall I think you need to try this out with different moisturisers and primers that work well together otherwise it will separate on your skin. 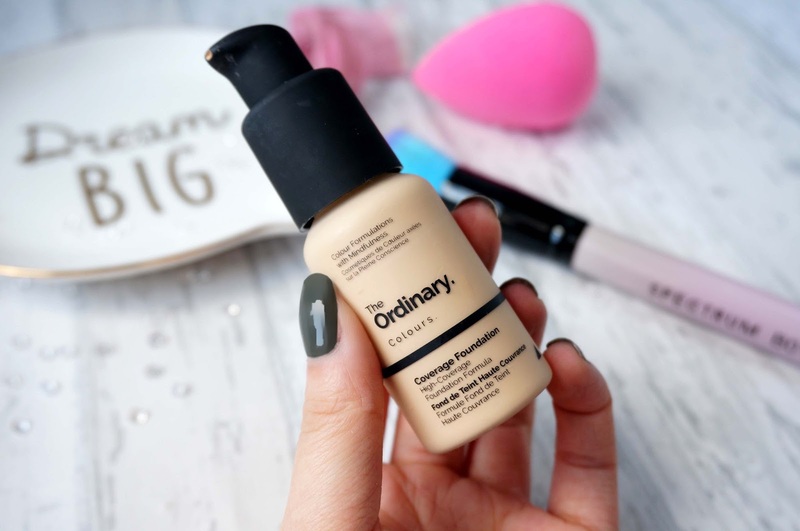 For a lazy minimal day which you aren't going to go around much, I recommend this and playing with this foundation more and more I am really enjoying it, for about £6 I do recommend this. If you've tried this foundation I would love your thoughts! Also, they are coming out with Watercolours soon so that will be an exciting product to try when it launches. Also #NOFILTER for my photo below haha. I hope you found this helpful for all those oily/combination skin guys and girls.Don't forget to enter my #giveaway here! I think this actually sounds right up my alley! It sounds a bit like the Glossier Perfecting Skin Tint but maybe a tad heavier? I usually like a little wash of color to help counter any redness in my skin and I'll go in and spot conceal any old scars. Lighter foundation/coverage just feels better on my skin as I feel like it can breathe more throughout the day :) I love that everything from The Ordinary is affordable - maybe it's time I put in another haul ! I think this looks lovely on your skin! I definitely don't think it'd be suitable for me as I suffer with uneven skin tone and need that extra coverage but it looks so glowy and fab on you! I kept seeing this foundation in peoples IG photos and wondered what it was, great that it's so cheap aswell! I think we have a similar complexion and skin type! It looks great on you and what a bargain.